Using oral history, underwater footage and found artifacts, “Ghost Ships” pieces together the history of boating on Lake Tahoe. The exhibit features a combination of salvaged vessels, video and historical documents to explore the stories of select boats and question the social and legal issues pertaining to salvaging vessels along with the impact of public interaction with underwater historic sites. In conjunction with the exhibit, the Tahoe Maritime Museum partnered with Placer Arts and NCArts to host a juried art exhibit, “Sunken Treasures,” featuring works with connotations of a sunken vessel. Artists chosen for the exhibit included Bunny California, Lisa Kurt, Eva Nichols, Ron Oden, Sara Smith and Susan Watson. An additional exhibit showcases fine art subscapes by local hydrographer Brent Von Twistern. The works begin with high-resolution images of the lake floor paired with above-water images and embellished with oil paint by fine artist Chris Hill. The result is where science and art intersect. A detailed map of Tahoe’s lake floor combined with a colorful rendition of the shoreline and surrounding landscape work to extend the viewers awareness beyond the water line and bring attention to important cultural and scientific features lying just out of sight. “Ghost Ships” and the corresponding art exhibits are on display at the Tahoe Maritime Museum. 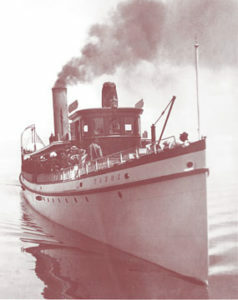 For more information, visit www.tahoemaritimemuseum.org.